For your pet’s skin, winter is dry, winter is cold and winter is not fun. The result is dry, itchy, flaking skin, for you and your pet. Along with changes in the weather, over bathing, under-grooming, nutrient deficiency in diet can all contribute to dry skin. Dandruff and dry, unsightly patches can appear making it even more uncomfortable. Left untreated, this can turn into a more serious problem such as hair loss and eczema. So how can you stop the constant itching and dry flakey skin? First, you should always consult your veterinarian to be sure there isn’t a more serious issue present such as mange. 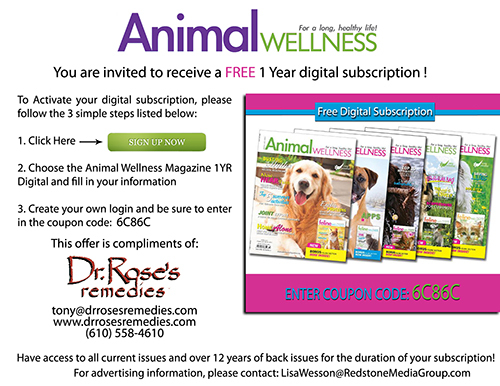 Once you are cleared, bathing your dog in an oatmeal bath will soothe the skin and following up with Dr. Rose’s Remedies will keep the skin moist. The salve can be applied directly to a dry patch and the spray can be used for a not-so-concentrated area. Dr. Rose’s Remedies is all natural and the olive oil, shea butter, and aloe vera oil found in Dr. Rose’s Remedies all act as natural moisturizers. 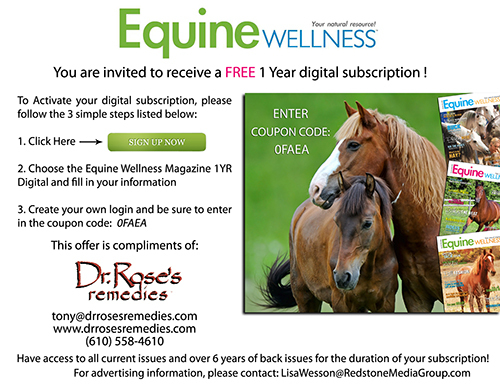 Click below to redeem a FREE 1 year subscription to Animal Wellness and Equine Wellness!